Who needs the same files twice? How much space is wasted on your hard disk? This software will tell you and can remove all these duplicates. At the same time it will protect other installed programs and the operator system from dangerours changes. And all of that with just one click and within seconds. 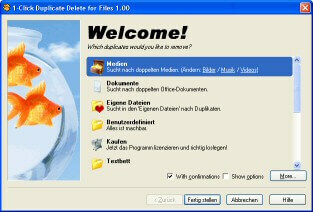 Try now for free: Download demo (2.03). For pros the program has the option to configure lots of details and to define what a duplicate actually is. But that's optional of course. A bit slower than the competition. Because we compare EVERYTHING. Perhaps we need 2 seconds more. But for that we're comparing everything exactly, including the contents of the file. Your files should be worth that to you. If you want, the program also compares NTFS data streams. You want it fast. That's why we're reading the file contents only if it's really necessary. We're using a fast and secure 192 bit hashing-technology (instead of unsafe 32 bit CRC). We're recognizing similar names like "Copy of" or "01 - ".